Experience the natural healing properties of tourmaline and clay by trying the InfraMat™ Legs-9T, a wrap created to produce a “high boot” form in which the user can use both legs, maintaining an optimal form of direct leg therapy. This mat helps restore health and promotes a natural balance throughout the body. The InfraMat™ Legs-9T is of unique design. The healing properties of this “boot” are specific to this mat, making it a rare commodity. This mat contains the healthy healing stone tourmaline and as many as 244 stones can be found in this mat alone. The InfraMat™ Legs-9T comes with a convenient LED display for optimal heat control. Recommended settings include medium heat, however, to avoid direct contact with the stones. If using a high temperature, cover legs with a towel to avoid stone contact. The heat from this “boot” penetrates deep into the muscles, tissues, and bones. The heat stimulates sensory receptors in the skin, decreasing pain signals to the brain to help relieve discomfort. Heat also decreases stiffness as it stretches soft tissue and muscles to increase flexibility and comfort. Unique to the InfraMat Pro series is the high number of negative ions, which are found throughout nature in such places as mountains, waterfalls, oceans, and beaches. These ions promote healing throughout the nervous system, restore calcium levels, and relieve stress by increasing levels of serotonin and melatonin in the brain. The InfraMat Pro Legs-9T promotes negative ion production to help heal the body. In addition, the clay and tourmaline stones found in the InfraMat Pro Legs-9T reduce swelling and absorb toxins to promote healing. 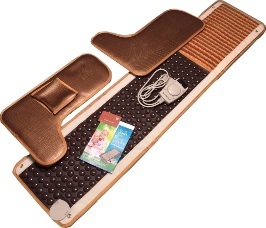 The InfraMat™ Legs-9T is a mat to be used specifically on the legs. The mat measures 143 by 33 centimeters plus 50 by 34 centimeters (143 x 33+50 x 34) and consequently provides an excellent boot to be used by both legs. The InfraMat™ Legs-9T weighs just 5 kilograms, making it convenient for storage and also lightweight and practical. Ideal at home or when traveling, the mat will go with you wherever life takes you. Increase your zest for life by taking control of your pain! This mat was designed for your health. Give yourself the gift of a lifetime and order your InfraMat Pro Legs-9T today. Or surprise a loved one with the generous gift of health. Experience the benefits of the InfraMat™ Legs-9T.